Amazon's multibillion-dollar HQ2 plan envisions a full-scale transformation of the Crystal City portion of Arlington, Virginia, into a modern tech hub — including helicopter landing pad, per planning documents — and includes a complete rebranding of the area to be known as "National Landing." Amazon’s announcement was praised by state and local officials across Virginia, who have pledged more than a billion dollars in tax incentives, transportation upgrades and education investments to coincide with the project and who predict the deal will provide a massive economic boost to the broader region. Northam later addressed a large crowd gathered in an unused Arlington warehouse set to be redeveloped into an office building as part of the headquarters project. He spoke from a lectern decorated with a banner reading, “Virginia is for Amazon Lovers” — a nod to the state’s famous motto. Still, some experts have cautioned the deal would likely lead to some growing pains, including exacerbating a lack of affordable housing in the region and potentially straining the region’s transportation infrastructure. In the days before Amazon made the announcement officials, word from company sources began to spread that Northern Virginia would be one of the two slots selected for the second headquarters. However, with the official announcement Tuesday morning, the D.C. area began learning more about the specific location selected to house the new HQ2. 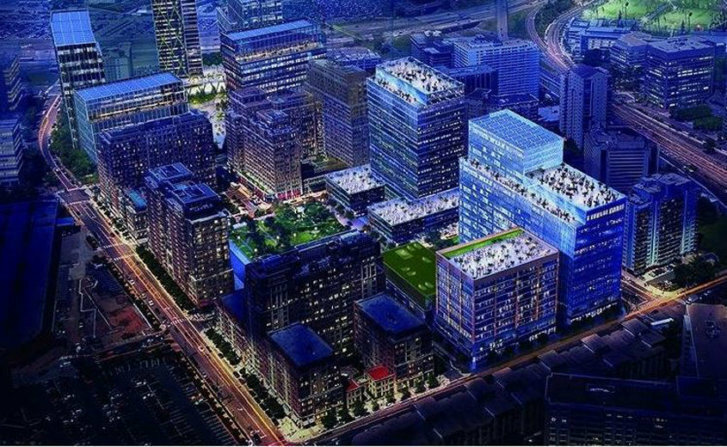 In its official announcement, Amazon called the area selected for the Northern Virginia location “National Landing,” a rebranding of parts of Crystal City, the eastern portion of Pentagon City in Arlington and the northern part of Potomac Yard in Alexandria. 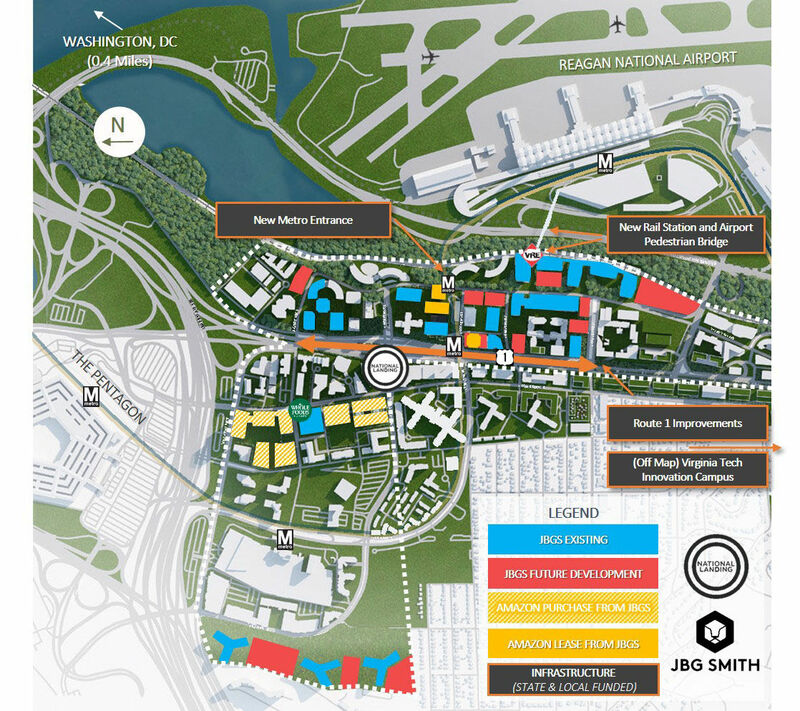 The location — sandwiched in an existing mixed-use urban environment of office towers, apartment buildings, hotels and restaurants — is within walking distance of three Metro stops as well as Reagan National Airport. Amazon announced it has selected the real estate firm JBG Smith to steer the new headquarters development project. Amazon said its Northern Virginia headquarters will start out with about 4 million square feet of office space in buildings in Crystal City and Pentagon City owned by the real estate developer. However, the company’s plans include the possibility of expanding its total footprint to 8 million square feet over the next 20 years by buying or renting new and existing buildings. All told, Amazon is planning to invest $2.5 billion in the Northern Virginia headquarters. Overall, the new headquarters will employ a total of 25,000 high-paid, high-skilled workers over the next 12 years, according to the company’s planning. The average salary of workers at HQ2 employees will clock in at $150,000 and rise over the years, per Amazon. Amazon said hiring will begin in 2019 with 400 positions. That will increase to more than 1,100 by 2020 before ramping up to a few thousand new hires annually through 2030. Some regional observers anticipate the influx of new tech talent could help build the D.C. region’s reputation as a tech magnet. Meanwhile, the official announcement provides clarity into the hefty package of tax incentives and transportation improvements offered up by local and state authorities to lure the tech giant to the region. Northam’s office said Virginia is offering up to $550 million in incentive payments for job creation in the state, with the potential for even more if Amazon ends up bringing more than 25,000 jobs over the next 15 years. “I suspect it’ll be sooner than that,” Northam told WTOP. At the local level, Arlington County has offered Amazon an “annual pay-for-performance” grant to the tune of $23 million over 15 years. The grant comes from taxes paid by tourists and business travelers on hotels and lodgings in the county. In addition, state and local officials are promising to spend millions on infrastructure and transportation improvements. Northam said Virginia will invest up to $195 million on transportation projects in the area, including additional Metro entrances at Crystal City and (the yet-to-be-built) Potomac Yard, pedestrian improvements along U.S. Route 1, a pedestrian connector bridge from Crystal City to Reagan National and other projects. In addition, Arlington County is offering $28 million in tax incentives for infrastructure improvements. Many of the transportation upgrades were already in the works before Amazon kicked off its headquarters search. Among the new details about the second headquarters revealed in newly released documents: Amazon plans to build a helipad at the Arlington facility. County planning documents state the company itself would cover the development, construction and operation of the helicopter landing pad. However, the county pledged to help the tech company obtain county, state and federal approval for the helipad. In its announcement, Amazon said economic incentives carried some weight in its decision, but the key factor was being able to attract top talent. Experts say the D.C. area’s growing concentration of defense and cybersecurity experts may have helped tip the scales in Northern Virginia’s favor. However, also likely helping seal the deal is a plan by Virginia officials to invest $1 billion in a 1-million-square-foot “innovation campus” for tech-focused graduate students in Oakville Triangle in Alexandria, Virginia, just a few miles away from the new Amazon headquarters. The campus, part of Virginia Tech, aims to create a pipeline of high-tech talent for the entire region, with graduate degree programs focused on computer science, software engineering and data science, among other fields. Operating out of temporary space, Virginia Tech plans to enroll 100 master’s degree students by next year. The campus is part of a broader package of education initiatives promised by Virginia as part of its bid to attract Amazon that also includes $50 million over 20 years in K-12 education and internship programs. Speaking at the official announcement in the Arlington warehouse, Kate Cristol, chair of the Arlington County Board of Supervisors, talked up the deal’s benefits to local residents. “Amazon’s presence in Arlington County will bring improved transportation systems, new parks, wider sidewalks, expansion of retail offerings — all things that Arlingtonians have long prioritized in their vision for the future,” she said. Matt Kelly, CEO of JBG Smith, said the arrival of Amazon will help stabilize an unsteady office market — nearly 20 percent vacant currently — that had “struggled to recover” from military base closures, the Great Recession and a round of across-the-board cuts to Pentagon spending. Amazon’s presence will diversify our local economy and will anchor our growing technology sector here for decades to come,” he said. Before the end of the year, the real estate firm JBG Smith will start construction on 130,000 square feet of new retail on Crystal Drive, Kelly said. The project is anchored by an Alamo Theater and also includes a grocery store, restaurants, bars and shops. Kelly said the company is also moving forward with plans for up to 4,000 new apartment units and nearly 4 million square feet of commercial space in the coming years — all that’s in addition to the space that Amazon HQ buildings will occupy. In Congress, Virginia lawmakers hailed Amazon’s decision, but also cautioned that it presents challenges related to traffic and infrastructure in the D.C. area. Kaine said the traffic and housing issues will require regional discussions. He also noted that some of Amazon’s employees may be commuting from D.C. and Maryland, as well as Virginia. Sen. Mark Warner, D-Va., noting his own background as a technology executive, expressed hope that Amazon’s investment in Crystal City will lead to job growth elsewhere in the commonwealth. Amazon touched off a nationwide competition, when it announced its search for a second headquarters in September 2017. The tech giant received applications from 238 candidate locations, before whittling down its search to 20 locations. In the D.C. area, the District, Fairfax County and Montgomery County, Maryland, all made significant sales pitches to try to lure the company. Maryland’s General Assembly, for example, approved legislation earlier this year allowing the governor to offer as much as $5 billion in tax incentives and transportation improvements to attempt to attract Amazon. After the deal was announced, former competitors from parts of the D.C. area that failed to land the Amazon deal still celebrated the Northern Virginia pick as a win for the region. The announcement also spurred congratulatory statements from officials in neighboring Fairfax and Loudoun counties. In a statement, Loudoun County Board of Supervisors Chair Phyllis Randall said the deal would lead to everything from more employment opportunities for Loudoun County residents to more passenger traffic at Dulles International Airport. “A rising tide lifts all boats, and we look forward to the whole community benefiting from Amazon’s second home in Northern Virginia and the D.C. metro region,” she said. WTOP’s Megan Cloherty, Colleen Kelleher, Hallie Mellendorf, Mitchell Miller, Max Smith and The Associated Press contributed to this report.